culture in youth between the ages of 18-35. 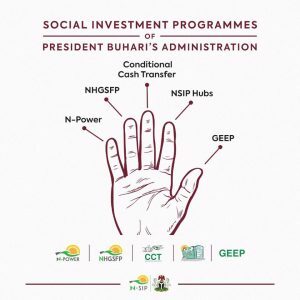 In August, 2018, the Federal Government said the sum of N140 billion out of the N500 billion budgeted for its Social Investment Programme (SIP) in 2017 has been released. Government Enterprise and Empowerment Programme (GEEP). This was even as it said that School Feeding Programme alone gulps N13 billion monthly to feed approximately 8.6 million pupils (8.596,340) in 46,247 public primary schools in all 24 states currently on the programme. The 24 states that have so far been covered by the NHGSFP include Abia, Adamawa, Akwa-Ibom, Anambra, Bauchi, Benue, Borno, Cross River, Delta, Ebonyi, Enugu, Gombe, Imo, Jigawa, Kaduna, Kano, Niger, Ogun, Osun, Oyo, Plateau, Sokoto, Taraba and Zamfara.